SAN FRANCISCO, California, August 23, 2012 (ENS) – The Center for Biological Diversity filed a legal petition with the U.S. Environmental Protection Agency Wednesday that asks the agency to set plastic pollution limits for ocean waters under the Clean Water Act. The petitionseeks to curb plastic pollution in the oceans that kills and injures hundreds of thousands of seabirds as well as many endangered sea turtles and monk seals every year. The Center for Biological Diversity formally requests that the EPA initiate a rulemaking to establish national water quality criteria to address plastic pollution, and publish information to guide states in monitoring and preventing harm to waters from plastic pollution. The petition seeks criteria to limit visible plastic pollution in the oceans to zero and set strict limits on small plastic items in oceans and on beaches. “Plastics are an everyday convenience for us but a daily death sentence for seabirds, seals, sea turtles and hundreds of other ocean species,” said Emily Jeffers, an attorney with the Center for Biological Diversity, a national, nonprofit conservation organization. Under the Clean Water Act, states must adopt water-quality standards recommended by the EPA and identify waters that do not attain those standards. This can result in better monitoring, assessment and cleanup of plastic debris. California and Hawaii already have taken action to control plastic trash under the Clean Water Act, and national plastic standards would cause other states to do the same. More plastic has been produced in the past decade than over the past century and much of it ends up in the ocean, says the Center, relying on research cited in the petition. Much of this plastic is discarded and makes its way into the ocean. Today, roughly 40 percent of the world’s oceans are covered in giant, swirling convergences of garbage, including billions of pounds of plastic. “In the Los Angeles area alone, 20 tons of plastic fragments, such as grocery bags, straws and soda bottles, are carried into the Pacific Ocean every day,” the Center said Wednesday in the announcement of its petition. Much of that plastic goes into the Great Pacific Garbage Patch, a mass of debris that spreads across 276,263 square miles, an area larger than the state of Texas. The Center is concerned that this plastic pollution has deadly consequences for at least 267 marine species, including endangered animals like Pacific loggerhead turtles, Steller sea lions and Hawaiian monk seals, which number just over 1,000 in the wild. Large amounts of plastic debris have been found in the habitat of Hawaiian monk seals, including in areas that serve as pup nurseries. Entanglement deaths undermine recovery of this seal, which is on the brink of extinction. “Plastic pollution is also known to attract and concentrate toxic chemicals. These chemicals can further accumulate as they pass up the marine food chain,” the Center explains in its petition. Fish in the North Pacific ingest 12,000 to 24,000 tons of plastic each year, which can cause intestinal injury and death and transfers plastic up the food chain to bigger fish and marine mammals, the Center says. 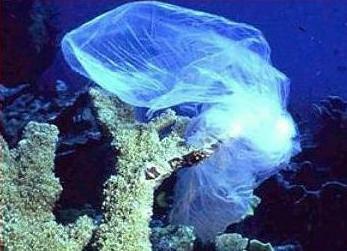 Marine mammals ingest and get tangled in plastic. Entanglement in plastic debris, especially packing bands, has led to injury and death of endangered Steller sea lions. In 2008 two sperm whales were found stranded along the California coast with large amounts of fishing net scraps, rope and other plastic debris in their stomachs. Hundreds of thousands of seabirds ingest plastic every year. 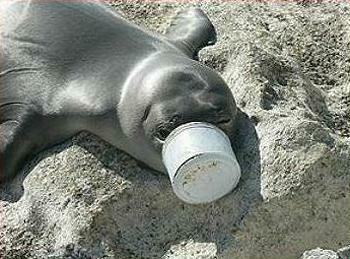 The plastic reduces the storage volume of their stomachs, meaning they consume less food and ultimately starve. The Center proposes the adoption of a quantitative criterion for beaches and sediments that requires “less than one item of plastic per square meter for ocean sediments, including beaches at or below the high tide line” for a waterbody to attain plastic standards.